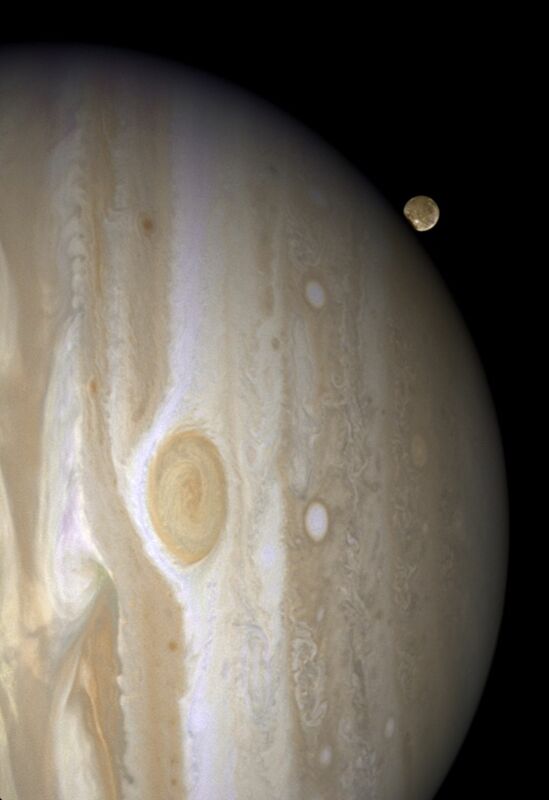 Hubble Space Telescope has caught Jupiter's moon Ganymede playing a game of "peek-a-boo." In this crisp Hubble image, Ganymede is shown just before it ducks behind the giant planet. Ganymede completes an orbit around Jupiter every seven days. Because Ganymede's orbit is tilted nearly edge-on to Earth, it routinely can be seen passing in front of and disappearing behind its giant host, only to reemerge later. Composed of rock and ice, Ganymede is the largest moon in our solar system. It is even larger than the planet Mercury. But Ganymede looks like a dirty snowball next to Jupiter, the largest planet in our solar system. Jupiter is so big that only part of its Southern Hemisphere can be seen in this image. Hubble's view is so sharp that astronomers can see features on Ganymede's surface, most notably the white impact crater, Tros, and its system of rays, bright streaks of material blasted from the crater. Tros and its ray system are roughly the width of Arizona. The image also shows Jupiter's Great Red Spot, the large eye-shaped feature at upper left. A storm the size of two Earths, the Great Red Spot has been raging for more than 300 years. Hubble's sharp view of the gas giant planet also reveals the texture of the clouds in the Jovian atmosphere as well as various other storms and vortices. Astronomers use these images to study Jupiter's upper atmosphere. As Ganymede passes behind the giant planet, it reflects sunlight, which then passes through Jupiter's atmosphere. Imprinted on that light is information about the gas giant's atmosphere, which yields clues about the properties of Jupiter's high-altitude haze above the cloud tops. This color image was made from three images taken on April 9, 2007, with the Wide Field Planetary Camera 2 in red, green, and blue filters. The image shows Jupiter and Ganymede in close to natural colors.